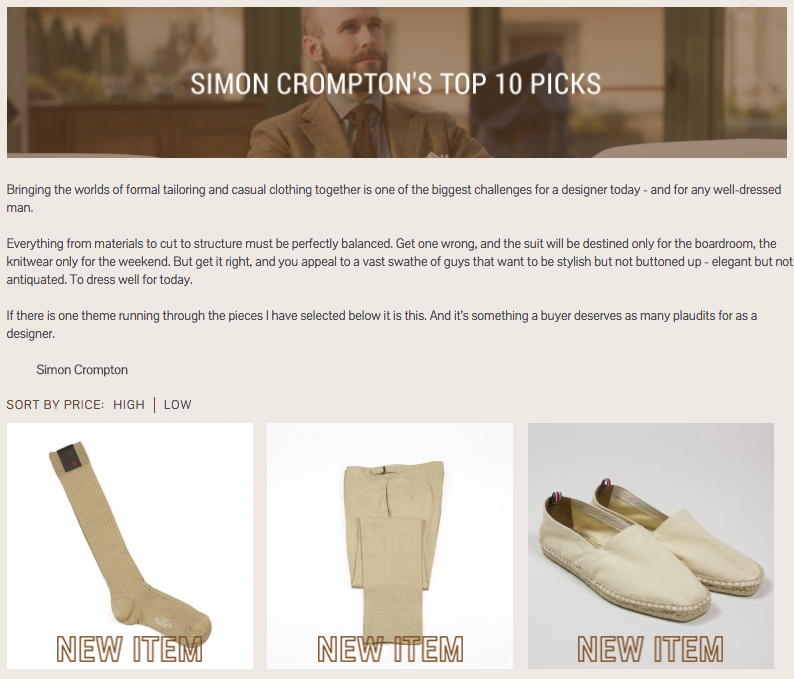 Greg at No Man Walks Alone asked me last week to write an article picking out my favourite pieces from their new stock. You can see the article here. Generally I focus on style advice, given there is often already some strong technical detail on the descriptions. If you click through to each individual piece, you can see my comments. As I mention in the piece, getting a sartorial angle on casual wear is something I find particularly interesting and think is particularly hard. It's why I like pieces like the field jacket and hemp/wool trousers. You can follow the discussion on My favourite pieces on No Man Walks Alone by entering your email address in the box below. You will then receive an email every time a new comment is added. These will also contain a link to a page where you can stop the alerts, and remove all of your related data from the site. would you be willing to do a post on (casual) summer dressing? It’s the area of dress I admittedly struggle with the most. Every time I go on summer/spring holidays I find myself browsing through the internet looking for a good mix of casual and elegant but mostly end up with a dissatisfying mixture and end up being over- and underdressed at the same time. How is No Man Walks Alone doing Simon, if you know? It seems that some online menswear retailers have been struggling lately with Bill’s Khakis and Carson Street Clothiers reportedly closing down and A Suitable Wardrobe being bought by The Hanger Project. This is an interesting exercice! To me, NMWA offer top end of middle range RTW items. Their taste is fairly quite close to that of regular PS readers, and therefore make this store one of the few online worth considering when one is looking for anything that is not bespoke or even high end. Certainly, catering to the needs of the gentlemen I’ve in mind turns out to be a big challenge. For from this level up, individuality starts playing a tremendous role. And yet, it should be less exacting to be responsive at this level than having to offer only high end items. Assuming of course that one reads PS to be able to clearly identify the defining features of a good wardrobe before any big leap into, say, bespoke. I only discovered this website yesterday and read as much articles as possible! What a great thing you have produced! Congrats and thanks for it. Some great items. Where in London would you go to get quality Espadrilles? I’ve been a big fan of your writing for a while. I’m curious as to whether you can recommended any other websites or writers doing work like yours or share any blogs or websites you usually read. I find your recommendation of espandrilles interesting. Would you wear the white ones with navy chinos?